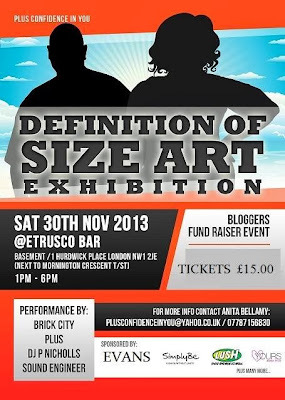 An event I'm currently working on is the Definition of size exhibition fundraiser. Created by the amazing Anita Bellamy, this event isn't about the fashion etc it's merely about changing and impacting the discrimination against plus size people, men and women and how society treats us. Although I work in the plus size fashion industry and can appreciate how much it has changed there is still a negative stigma against plus size. 'We are here to promote and celebrate women and men of size We have been campaigning for for a few years now against body image discrimination and how society treats people of size. We are human and we come in all shapes and sizes and are no longer going to try and be accepted or fit in with how people feel we should look."